five.one.five.zero.zero. : What a month it will be! What a month it will be! This month is shaping up to be a busy, yet exciting month. Next week I am starting coursework to earn a CoETaIL certificate. You say, "What is that?" It stands for Certificate of Educational Technology and Information Literacy. It is a program run by two tech specialists from the International School of Bangkok and Yokohama International School. I am excited to see what they are doing and learn from their experience. But, it does mean that I am back in school AGAIN! Really, I thought I'd had enough. The courses are all online and open only to international educators. If I want, I can use the credit hours towards a Master's degree from SUNY-Buffalo. However, I think three degrees is enough. Anyways, the better news is that for the first time, I don't have to pay for the courses! I submitted an application to the Professional Development committee at ASM and my request was approved to cover the expenses of these graduate level courses. If any of my international teaching friends are interested in this program, they are looking for 10-15 more people to fill in another cohort. Go to the website or email me for details. This weekend an international math competition for high school students is being held at ASM. I hate to racially profile anyone or anything, but the registration list is like a who's who of high school students with Asian backgrounds. I'm curious to see what this competition looks like and Kate and I volunteered to help out. (Aren't we so nice!) We get to crunch numbers to see how the kids are stacking up against each other...reminds me of plugging away recruitment numbers in the Penthouse of Alpha Phi to select the girls for the next round. And, then the real good stuff begins. Wicked. London. February 11. 10th row. BANANAS! I know, I hear the whispers..."Zimmer, haven't you seen it like a zillion times already?" Yes, yes, I have. And, I'll see it a zillion more! Then a week of school and it's White Week. White Week, what? Oh, yes, the Europeans like to have their time to go skiing. Well, I may not be headed out to ski, but Kate and I have made plans to fly to Amsterdam that Saturday and stay until Wednesday. Then we'll take the train to Paris and stay until the following Saturday. I will cross my fingers that we can avoid any public transportation strikes, and I will take good notes on all the best places for my niece, Melissa, since she is planning a five week class in Paris this summer. London, Amsterdam, and Paris...what an exciting month! sooo jealous, but as I said before, at least I can live a bit through you. Enjoy!!!! Sounds fabulous! Enjoy, enjoy, enjoy! 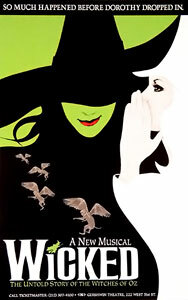 I have never seen Wicked. I guess I should go!